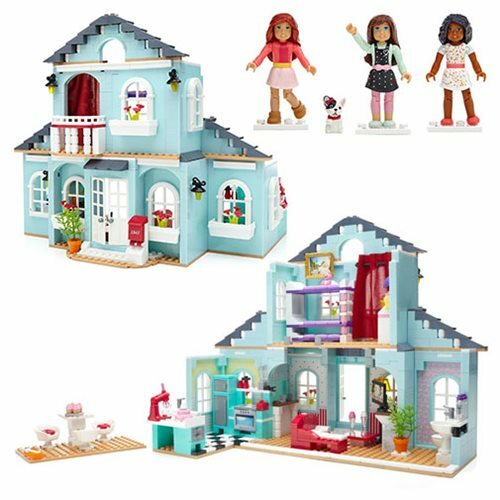 You have two gorgeous design choices with Grace's 2-in-1 Buildable Home by Mega Bloks American Girl! Choose to build Grace's Home, or her Patisserie and Slumber Party with this deluxe 2-in-1 set! There's no better feeling than returning home after an inspiring Paris getaway, and Grace is glad to be back! To celebrate, she's invited her friends, Maddie and Ella, over to decorate the house's living room, kitchen, garden, and patio. The buildable Patisserie features a bakery with deliciously themed accessories. The Slumber Party can be built into a bedroom with rooftop area, bunk beds, and nighty-night accessories! The options are endless in this 2-in-1 building set, and the choice is yours! Contains 749 pieces. Ages 8 and up.